Some people carry knives when they'll be cooking somewhere else. Me, I carry a microplane. 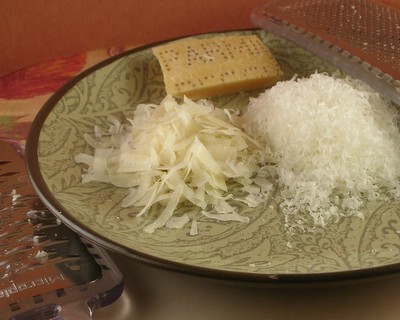 With just a few whisks, it makes piles and piles of fluffy Parmesan, lemon zest, lime zest. This is one of several versions. I like its broad face. I like the rubber handle. I like the fine rasp. Nov 2006 Update: While I love the fine grate, I really really love the ribbon grater, especially for Parmesan and chocolate. In my kitchen, both are necessities. I've also learned to measure by weight, not volume, whenever a microplane is used. Think about getting the finger guards. 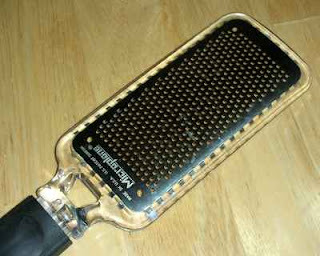 While I've only scraped myself once, it was sore for several hours ... and I have a friend who loves her Microplane but does have trouble getting scraped.